You are here: Home / Beauty / Vermont: Maple Syrup, Skiing…and Soap? Vermont: Maple Syrup, Skiing…and Soap? I admit – I’ve never been to Vermont. But I’ve often thought about making a side trip there on one of my yearly writing trips. When I do think of Vermont, I think of maple syrup, quaint bed and breakfasts, skiing, and the Bing Crosby movie White Christmas. These elements, minus Bing Crosby, paint the quintessential picture of this New England state. But beyond ski hills and pancakes, what you may not know about Vermont could surprise you. For one thing, it is the home of Vermont Soap Organics, the purveyors of everything soap – from cleaners to wash your counters to sultry body soaps for your shower and tub. And, like the name says, the products are made from all organic ingredients, handmade from hypoallergenic vegetable bases like coconut and palm oil. The facial and hand soaps are made to fit any skin type from sensitive to dry. Plus – and this is my favorite part – many of their soap products come in a number of scents, including lavender, citrus, butter, and honey. How do I know all of this about Vermont soap when I haven’t even visited the state? 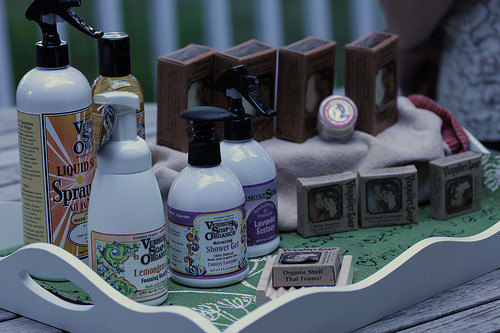 A few weeks back, the folks at Vermont Soap Organics offered to send me a few of their soap products to try. Now, you all know by now how much I love soap products, especially little guest soaps, so I just couldn’t pass up a sample or two. After doing some research about the product, reading about the ingredients and history, and more, I was smitten with the little soaps. Now, I have quite a selection of soaps on hand, too many for me to use – although I could definitely give it the old Vermont college try. Instead, I’m going to share my soapy wealth with you! To enter, you can either Tweet/Retweet this post or go to the Vermont Soap Organics Web site and review the scents of their organic soap bars. Then, leave a comment on this post (my post) telling me which of the scented bar soaps most intrigues YOU! Mine would be peppermint, naturally, because you just can’t go wrong with peppermint, especially around the holidays. You must enter the giveaway by 9 PM Eastern on Wednesday, October 13, 2010. I’m particularly intrigued by the Lavendar Oatmeal soap. Lavendar is one of my favorite fragrances (I actually grew some lavender in my garden this summer!) and is light and fresh. I’m wondering how that would combine with oatmeal which sounds warm and comforting. Great contest! Definetly the lemongrass…would go perfect in my guest bathroom! What a lovely giveaway! I am intrigued by the Citrus Sunshine soap. I like soaps that smell fresh and fruity so I think I would like it. I have to say I’m liking the “balsam swirl”! Wow, all of the Vermont soaps look wonderful. The most intriguing would have to be Lemongrass and the second most intriguing type would have to be the Butter Bar, I just love shea nut butter! What a wonderful choice of all organic soaps. I have to admit that I too love to have wonderful organic soaps around. I am excited for this giveaway – I have my fingers crossed! Thanks! Oh, lavender blossoms, of course! There’s nothing more soothing to smell than the fresh scent of lavender. One of my fondest memories of a trip to New Zealand, the south island, was visiting a lavender farm. The scents and the views were wonderful. Thanks for this giveaway, and the chance to win. I’d love to try the butter bar. I love shea butter anything, and sometimes don’t want a lot of fragrance in my soap! I’ve got to go with the lavender swirl! I’m really into anything lavender scented lately because they put these great cold lavender towels over your eyes at the yoga studio I go to and it’s so awesome and relaxing! I would love to try the Tea Tree, because it is so soothing and good for the skin.